Idon’t know about you, but by the end of May I felt as if we had already had summer and were into autumn! There was such an explosion of flowers in April and May that there wasn’t a lot left to come in June. However, the cooler weather then meant that there was a nice long flowering season for some things, especially moon daisies and elderflower. I hope we get a proper summer now for people to have holidays, especially if you’re one of the many staying in the UK. Unfortunately, I think our bee-orchids have disappeared from the canalside near Bittell. British Waterways have changed their mowing contractors (I used to be in touch with the former ones) who have twice mowed the ground at completely the wrong times, leaving the orchids nowhere to be seen. However, the poppies at Blackstone that I mentioned last month were absolutely stunning this year – though of course very early. This month I am looking at some of the plants and animals that you might find in other parts of the country, or even the world, and some of the things that have come from abroad to become part of our wildlife at home. 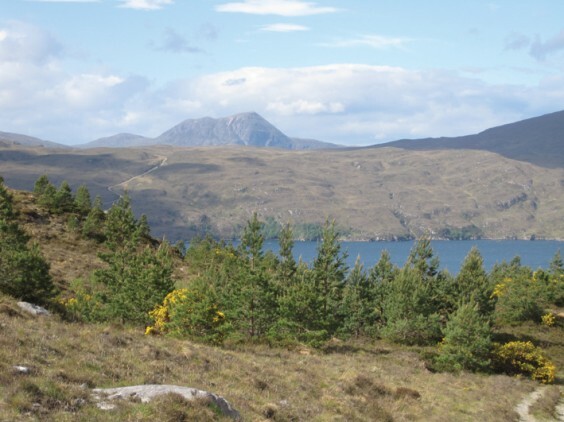 In May, I revisited Ullapool and the wild peninsula of Coigach in the north west highlands of Scotland. The first thing that struck me was how colourful everything was. Of course, they had the same strange May and June as us, so all the spring and summer flowers seemed to have come out at once. The hills round Ullapool were blanketed with gorse, more than I have ever seen round here, blazing yellow and smelling like hot coconut in the sun. There were remnants of ancient Scots pine forests, and an encouraging amount of replanting of this old species to make new woodland. Among the gorse were bright pink rhododendrons. These were not originally native but have colonised this kind of landscape to the point where they can be a threat to other species. In the quiet river valleys were native birch and rowan groves, grassy beneath with primroses, violets and bluebells growing abundantly along with mountain flowers such as butterwort. This is a fleshy plant like a green starfish with a beautiful purple flower rising out of the centre. It grows in bogs, and was struggling a bit in the dry weather. Later this wet area will have masses of bog asphodel, an upright stem of dark yellow flowers. There were fragrant plants of bog myrtle too. This, also known as sweet gale, scents the air in summer. It is believed to have anti-insect properties, and is now commercially sold as a midge-repellent! We didn’t need that in May, but I bet they will by now with the wetter weather. It is hard to remember that midges are wildlife too when they are biting you all over your face. All of these plants you may see in any mountain or moorland area. Along the tree-lined main river, we found masses of a ground-covering plant called claytonia, making the ground pink. This plant is also called miners’ lettuce: it has a pink or white flower growing out of a rounded leaf. It is highly edible and you may find it among mixed salad leaves early in the season. There was also a mass of bright yellow pimpernel as well as the usual bluebells. By the shore line were white sea-campion and the beautiful pink thrift. In the wilder parts of Assynt and Coigach we saw other interesting plants. There were plenty of orchids, mostly the early purple variety. Later, the white butterfly orchid will appear. Lady’s mantle is very common – we know it more as the garden plant alchemilla, but it is a native and actually grows in a few old pastures round here as well. We also found a different variety, the alpine lady’s mantle, up on the rocky hills. Milkwort is common everywhere, a small bright blue-flowered plant that grows by coasts and on hills, but not round here. This, with violets and butterwort, made whole areas blue-purple. We saw mountain everlasting, which is our native version of edelweiss, and even found something rare. This was the mountain avens, a relative of our common wood avens and the water avens found in northern England. It has large open flowers, with up to eight white petals and strongly yellow stamens. Something else I found really delightful was a tiny creeping willow, about as big as your finger but a proper little tree. Even though it was only May, we saw the first heather coming into bloom. By now this will be lovely everywhere there is moorland, mountain or acid heathland. There are three main types: ling or common heather, bell heather and cross leaved heath. The bilberry, which would usually be blooming, had finished but the berries were set. All of these acid-loving plants can be found in a few places near here. These include the Lickeys, the Devil’s Spittleful reserve (see last month’s Village), Hartlebury common near Stourport, and Lion Wood near Portway. Birds were everywhere in Scotland too. The fact that the cuckoo called all day everyday was probably a sign of the presence of meadow pipits, one of their host birds in whose nests they lay eggs. There were more skylarks than you would ever see round here, and the crows were of the northern hooded kind. Among sea birds were oyster catchers and curlews calling, herring gulls squabbling round the fishing boats – and fish and chip shops – and many varieties of geese and ducks. Also on the shore were rockpools, full of lovely sea-anemones and reminiscent of childhood days. Earlier in the year I spent some time visiting relatives in Thailand. There too the birds were wonderful. The one we heard most often was the oriole (which seems to say “oriole, oriole”). This comes to the Scilly Islands and sometimes to southern England too. There was another common bird called the coucal, a bit like a cuckoo. One morning at breakfast we sat on the veranda watching a kingfisher fishing nearby, seemingly unafraid. We saw brightly coloured sunbirds and a beautiful blue flash which was a fairy bluebird – what a lovely name! Among the flowers were jacaranda and bougainvillea, as in all sub-tropical areas, the latter especially beautiful and in all colours from white to deep purple. Best of all, of course, were the orchids. There was a huge, beautiful one just growing out of a tree outside the window of the room we stayed in when we went up to the River Kwai. In some of the gardens were an enormous range of them, and they are the national flower. Mind you, I still think our little orchids are as lovely in their own way. It’s interesting how wildlife is half-familiar, half-different when you go that far away. There were orange tip butterflies, but much bigger than ours. There were big red swallow-tail butterflies, not rare like our swallowtails but very common. In the wet lands were white cranes and egrets. When I was young they would have been a very exotic sight. Now we have cattle egrets breeding in this country, and cranes visit too. Visiting Devon last year I watched egrets along the river where I used to walk as a child. It’s a good example of how birds are appearing or reappearing in the country. Some of this is due to climate change, and some to improvements in our habitats, and habits, which have allowed resettlement of birds which we had driven out. Perhaps the most notorious recent resident is the green parakeet, which is colonising London parks and may be driving out native birds. More welcome is the red kite, now a familiar sight over the M40 when you cross the South Downs, and the osprey. The story of how the osprey was re-introduced in Scotland is interesting. At first, when a breeding pair arrived, naturalists tried to keep people out of the area. But the eggs kept being stolen by unscrupulous collectors. So they encouraged the public to come and watch from a safe distance, and they provided the protection needed. Now ospreys are established in Scotland and the Lake District (where I’ve seen them), and have even been seen in Worcestershire. Our native plant life is often added to by alien plants naturalising, from gardens or carried here accidentally. Trees especially become part of our landscape and we forget they weren’t originally here. Among these are limes, sweet chestnuts and horse chestnuts. Trees grow so slowly that they tend not to threaten native ones. But smaller shrubs like rhododendron ponticum can take over, and herbaceous plants like Indian balsam have completely filled some of our river valleys. Spanish bluebells, the garden kind, are a threat to native bluebells as they interbreed and eventually become dominant. Many of our so-called native plants were brought over by the Romans or subsequent incomers, as herbs or food plants, and become an established part of our native flora. In fact, there is often argument among botanists about which plants are native. A good example is one we found by the shore near Ullapool. This was the uncommon star of Bethlehem. I’ve seen this before in Devon, and it may or may not be native. The rather similar snowflake is also of dubious origin, but grows well in a couple of places near Alvechurch. However, the spiked star of Bethlehem is native and grows only around Bath and west Wiltshire where I used to live. It’s called Bath asparagus as the young shoots are edible and delicious. This is a good example of a plant that’s very local. Animals too are introduced. We all know that the grey squirrel, which came from America, carries a disease which can wipe out the red squirrel. The reds are now confined to Scotland, the far northwest of England and Wales, and pockets in the south like the Isle of Wight. There are various attempts to keep grey squirrels away from them, including some culling. I’m in two minds about how to treat our naturalised aliens, whether fauna or flora. Once they are established here it seems wrong to kill them, and many of them are attractive and enhance our neighbourhoods. I would hate not to have the waysides full of lupins in Scotland, or motorways fringed with Michaelmas daisies, or the purple toadflax which lines the railway into Redditch. Some things we think of as much-loved natives are anyway only a few centuries old. However, I don’t like to see a threat to our native species either. I would shade towards an acceptance of alien species, though I do understand that some management is needed when they directly threaten natives. As I have been “away” in this article I shall come “home” for the poem. It’s my contribution to a group the Withybed Poets wrote for our local bellringers as they await work to restore the bells. Making our band the champions. The bells will go silent for repair. Without my Queen’s and Whittington?